It seems the appropriate place to begin is the beginning. So our first look at specific theme park albums will be the first two releases from Walt Disney World. 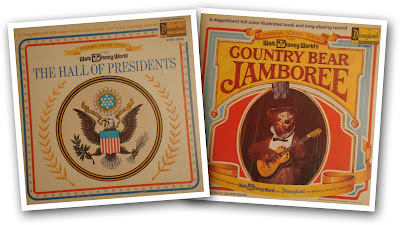 The first two albums to be released for WDW were The Hall of Presidents and Country Bear Jamboree. These two records were both released in the storyteller format which includes a "storybook" along with the record. This was a popular release method for movie-related albums as it allowed pictures from the movie and read-alongs to accompany the music or voice record. For these albums, though, the storybook's purpose is to give more information about the attractions. The album for Country Bears was the first to be released. Side I includes the entire show. Side II features area music for the Mile Long Bar area. The storybook features background information for the various characters in the show. For example, Wendell originally wanted to be an athlete, but kept running into issues due to his small stature. Big Al "was resident bard and balladeer in the swamp before Walt Disney World was built (and three badgers and an alligator have expressed great joy that he is now singing for people)." Since this album, the Country Bears have had a far-reaching presence in the realm of WDW soundtracks. Either "The Great Outdoors" from the Vacation Hoedown or "The Bear Band Serenade" from the Jamboree have appeared on almost every soundtrack compilation album that has been released since. 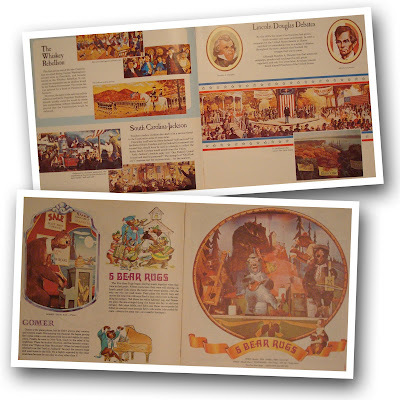 Also, the entire Vacation Hoedown and Christmas Special shows appear in the Disneyland 50th anniversary collection. The Hall of Presidents album features the entire attraction. At the time of the record's release, Nixon was the latest president on stage. The storybook with this album includes little snippets of U.S. history about such things as the Constitution and the Civil War. Unlike the Country Bears, The Hall of Presidents has been largely neglected on park albums since its soundtrack was released. I am enjoying your site. Thanks for sharing more about the music. I consider it a Disney Treasure! To all who come to this happy place... Welcome!